It was brought home to me in Dublin Airport. I'd not been keeping up with the news because I had just spent a few days running an NLP workshop in Dublin. And my spare time had been divided between preparing work or socialising with friends (an essential part of Dublin life). I had happily forgotten about the UK's weather, incessant rain, heart-rending flood damage and the petrol supply difficulties being caused by panic buying ahead of the fuel protests due here next week. As I browsed in the bookshop while waiting for my flight back to England I glanced at the UK newspaper headlines and, for a moment, my mood changed. The diet of gloom and doom that the media provided got to me – just from looking at the headlines! Right then it felt as if, for a few days, I had been living away from 'reality'. And it felt as if I should come back down to earth and face it that life is tough and dangerous and get into the 'isn't life hell' frame of mind like most other people! Psychologists tell us that pessimists are more realistic that optimists - they're just not as happy! I'm not sure I want to be that 'realistic'. I rarely buy newspapers. I can live without their diet of bad news, gossip about other's private lives, and the politically biased views of the wealthy few who run them. My main sources of news is the radio plus occasional TV bulletins and a bit of fill-in from the Internet. The daily reminder of how awful life is clouds our views. Not instantly. It is like the constant drip of water that over years wears away huge limestone boulders. After a while we begin to feel guilty about not feeling bad... How can we feel good and cheerful and carefree when there are people suffering everywhere? When the TV cameras get such graphic shots (to keep up the ratings) that you can almost smell the blood as another corpse is hauled from the wreckage of the plane or the demolished building thousands of miles away – in real time, at the very moment you are watching it! We forget about fun, and playfulness, and frivolity. How can we feel such feelings when we read about babies being born with AIDS a few hundred miles away. We begin accepting that life is, indeed, hell. How can we not when we see full colour close-ups of the mashed face of the eighty year old woman who has just been mugged in our own town? The result of years of conditioning ourselves(!) through using the media to focus on what is NOT working in the world is that we also begin focussing on what is not working in our own lives. We start zooming in on the problems and difficulties. And ignoring or down-playing the pleasant moments and the successes. Our carefully developed pessimistic attitude is on the lookout for evidence to support itself. 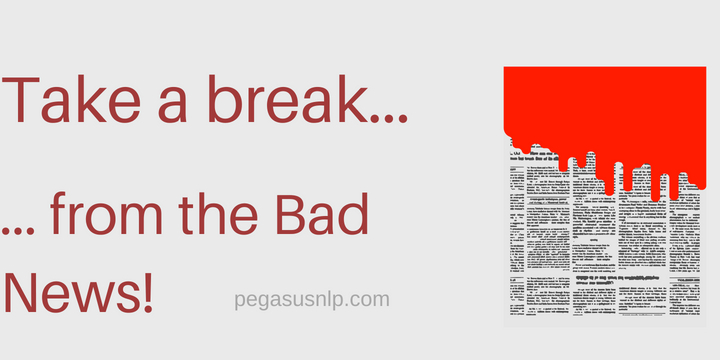 How does bad news help? Apart from making the media suppliers wealthier and helping the journalists get awards – how does this endless supply of bad news help anyone? Live Aid helped raise lots of money – a long time ago. Subsequent campaigns helped and continue to help in smaller ways. They are worthy and deserve support and are successful because they exploit the media. But the media itself rarely helps – they just use unhappy situations to further their own aims. Take a day off from the gloom! If it's really important to you to continue being 'realistic' here's a suggestion: how about allowing yourself a day off occasionally? … on what IS working in your life – instead of what is not working? …on what you are happy about instead of what you are dissatisfied with? .. on what you DO like about the people you encounter – instead of what you do not like? Begin by deciding to insulate yourself from the media for your Rest Day. Experiment to discover if you can get by without your daily dose of news about horrors, famines, floods, murders, earthquakes, or diseases, plane crashes, etc. See if it is possible to cope without viewing, or reading or hearing about the carnage on the roads, the crime that makes your neighbourhood a no-go area, the political scandals or international tensions. It'll be tough – but you can do it – after all it's only for a day (smile!). Of course, this may cause your conscience a niggle or two. You may have concerns about being happy when there is no much unhappiness in the world. But the day off will benefit you and enable you to regain a degree of equilibrium. And you can go back to the old ways tomorrow if you really want to. And, as you're at it how about looking out for the Good News that never gets reported in the media. The little kindnesses with which people treat one another. The courtesies they show one another. The gestures that lovers make as they walk hand in hand. The wonder in the face of a toddler as she watches a street or mall fountain. The beauty in the gnarled face of the old man sitting and watching the world go by. The gestures of tenderness. The little signs of friendship. And, again, just for today reverse your habits. If you normally tend to only notice things to get annoyed about start looking for things that warm your heart. If you normally look for the evil in people start looking for the humanity. If you normally look for things that are not working look for things that are going well. If you normally perceive hatred and misery look for joy and love. We will always find supporting evidence for our current attitude and beliefs - so pretend to have a different attitude for today. And see what it turns up. That is why if we are in the habit of only perceiving what is unpleasant or not working in life we will get really good at only recognising the bleak side of life and ignoring the opposite. This is not done deliberately it is the result of a habit of negativity supported by an attitude of negativity. So allow your Rest Day to help you develop a more balanced view.